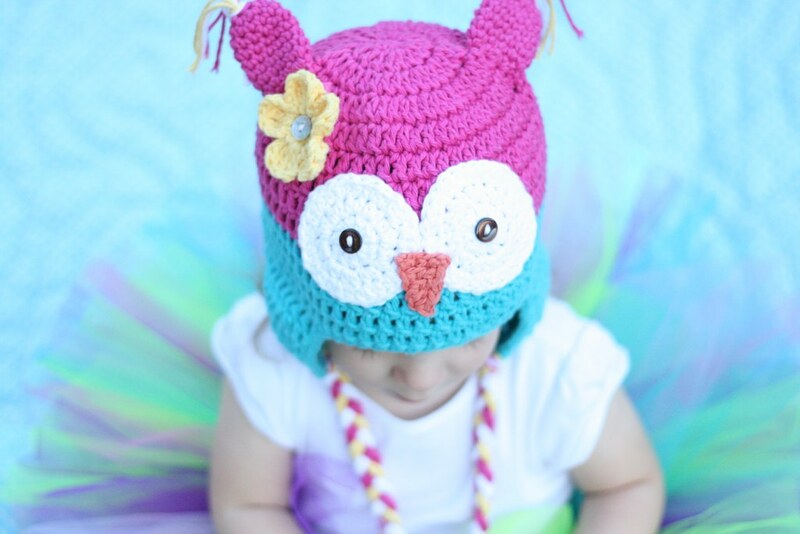 The free owl hat crochet pattern in the newborn size has been so popular, I’ve decided to offer another size for free. If you’re interested in all of the sizes, they’re available in my Etsy shop. Please note that the newborn size is slightly different than the one offered in my shop. This hat is for the toddlers in your life. 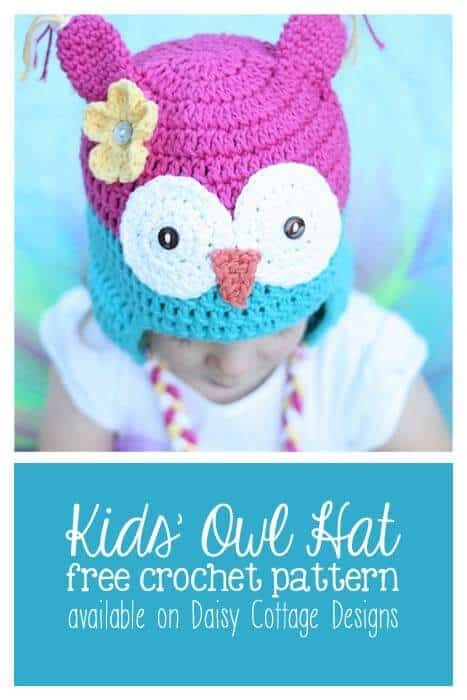 Fitting kids approximately one to three years old, this hat first heads that measure 18″-20″ in diameter. If you make a hat, please use the hashtag #daisycottagedesigns on Instagram or put them on Facebook so I can see your finished items! Stop here and add one round of sc if you want a beanie. If you’d like an earflap hat, keep going without cutting yarn. You will now need to work the second earflap. On the front of the hat, skip 16 stitches and begin the second earflap by joining yarn with a sl st. You will work it exactly as you did the one above. Final Row: After working the second earflap, single crochet evenly around the entire hat. Work two sc into the corner stitches of the earflaps. Fasten off and weave all ends. You’ll now make the features for your owl. Remember, you’re now using the H hook. Leave a long tail for sewing on the hat. Row 9: sc in each stitch around. Sl st in the next stitch. (12) Fasten off and leave a long tail for sewing onto the hat. Please note: at first, it looks like you’re making a circle. Keep working. Your ears will take on a tube shape. Row 1: sc in the second ch from hook, hdc in the next, dc in the next, tc in the last two. Finish off and leave a long tail for sewing on the hat. At this point, sew the features on the hat using a tapestry needle. The placement is up to you. For each side of the hat, cut 9 strands of yarn (I usually do 3 strands each of 3 different colors) approximately 38 inches long. Fold them in half and pull the “loop” through the hat. Pull the loose ends through the loop to attach the yarn to the hat. For the tufts at the top of each ear, cut 3 strands of yarn approximately 9 inches long. Fold them in half and pull the loop through. Pull the loose ends through that loop to attach the top of each earflap. You are welcome to make any Daisy Cottage Designs patterns and sell your finished items. I do ask that you take your own photos and not claim the pattern as your own. I would be very appreciative of a link back to the original pattern. If you like this pattern, you’ll definitely want to check out the other free Daisy Cottage Designs patterns. Is it one sken of each color for the hat or more? Taking it as a craft to Alaska and don&#39;t want to be short on yarn when I get there. Im trying to make this for my 2 year old and cant find where the flower pattern is? I was up til 2:00 am making this for my 2 year old. I completed it and it is big enough for my head. How can I make it smaller?? Aww.. I know that’s frustrating. Were you using worsted weight yarn? If so, I would go down a couple hook sizes. Thanks a lot for sharing this great pattern. 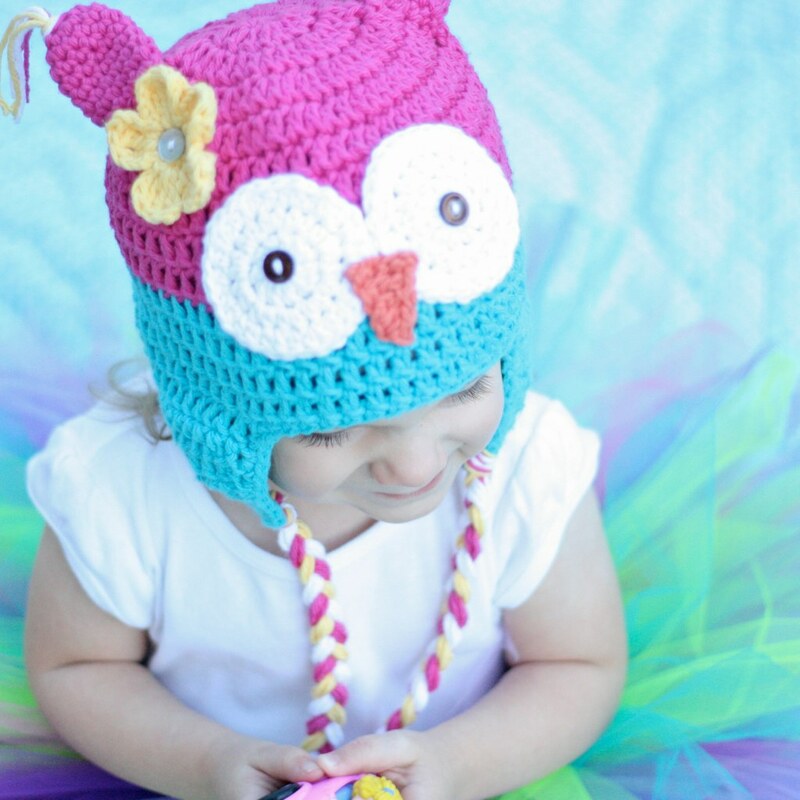 I do have a question though, I cant figure what is worsted weight yarn & how to decide which yarn would be better for those amazing owl hat !! Worsted weight refers to how “thick” yarn is. It will say on the label what weight it is (baby, aran, chunky, etc). I just choose a yarn that’s soft in the color I want. 🙂 Cotton is more breathable. Acrylic is inexpensive. Wool is warm. Hope this helps.